Carmona earned a Bachelor’s degree in Political Science from Northwestern University and spent the last year and half in the Emanuel Administration working on a plethora of policy issues, including immigrant integration policies, as well as public health and small business initiatives. Prior to her work at the Mayor’s Office, Carmona worked with Crimson Leadership Group to create opportunities for underserved communities and immigrant students and families in Illinois high schools to engage with the college admissions process and leadership development. Earlier this week Lawndale Bilingual Newspaper met with Carmona at City Hall to discuss her new role as director for the Office of New Americans and why education is the key element to success. Lawndale Bilingual Newspaper: Describe your sentiments around the new appointment? Tonantzin Carmona: Well, I definitely am proud and honored. I was born and raised in Little Village and I come from a family who were committed to serving our community. It just means a lot and I am just honored that I have been given this opportunity to serve and to give back to my community, my city. LN: There are great leaders emerging from the Little Village community, including you, do you see yourself as a role model for younger generations to follow suit? TC: I think it’s amazing. I think our neighborhoods and our community of immigrants such as, Latinos, Polish, and Chinese all deserve role models to aspire to. I never set out to be a role model. I just set out to make my family proud because my grandparents came into this country looking for a better opportunity and they gave that to my parents and my parents worked hard so I could have it. So my goal was just to make my family proud and make my last name, Carmona, mean something positive. I think it is just an amazing opportunity to not only give back, but to also serve as that role model for another young girl. LN: You come from a family of activists, what are some of the lessons you took from them that will help you as the new Director for the Office of New Americans? TC: So my tía is Maria Saucedo, who was actively involved in her community as an educator. A school was named after her, the Maria Saucedo Scholastics Academy. My family was just very strongly supportive in education and moving forward through education. That is something that always resonated with me. So I knew from a very early age that to get ahead, to move my family, my community forward, I need to get a good education. My tía served as a great example as did my grandmother. My grandmother did not speak English and, yet, she was always going to our schools and advocating for us and also advocating for the children of other families who did not feel like they could speak up. I really liked that about her. She did not let anything hold her back. 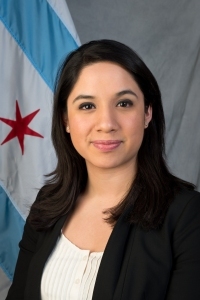 She really advocated for her community and her kids and through that actually ended up becoming the president of the Chicago Multilingual Parents Council for the Chicago Board of Education. As an advisory council she made sure that multilingual communities had access to resources…so I took those lessons. I grew up around people who were always about giving back. LN: In your new role, what do you hope to accomplish? TC: Well, I definitely want to move the mayor’s agenda forward and make Chicago the most immigrant-friendly city in the world. It is definitely a challenge, but it is also an admirable goal I think it is one that all cities should strive for and I am very glad that we are doing that and that is our stance on that issue. The Mayor understands, and we understand, that immigrants add value to our cities and they are contributing every single day, so if I can help move that forward by working with our existing Chicago New Americans plan, which was put together with our advisory council, which is made up of 50 organizations across the city…I really want to continue with that work and build on that work and expand on it and see how we can move forward with it. We want to create better access to resources for our youth, make sure businesses are growing, and making sure we are a welcoming city.